I'll admit that I picked this up because it had a blurb from George R.R.Martin, and I think it was free. If not I paid no more than 2 dollars for it. I've had this book awhile somewhere around 2 years. Over the last few weeks it's become my bed time book. I've been trying to read down some of my paper books and was mostly reading this a night when I shut off the lights. (My ereader is back lit. 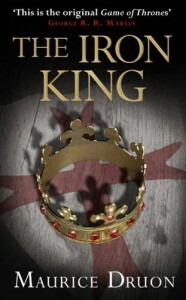 GRRM definitely takes some of his ideas from this time period and there are some surface similarities,but this book is not fantasy. I'm certainly not an expert on this time period,but I did enjoy the book. It's full of court intrigue. It took me about halfway through it really be pulled in. The writing style is pretty sparse, and unemotional. Even during some torture scenes which I'm never a huge fan of. I realize that they are accurate for the time period, it's just I'm squeamish, and it's just not my taste. Overall I did really like it, and will be continuing the series. Think a song of ice and fire without the supernatural elements.